Prominent & Leading Wholesale Trader from Pune, we offer traffic light signal controller. Over the years of experience in the industry, we have been able to provide the customers with a Traffic Signal Controller. 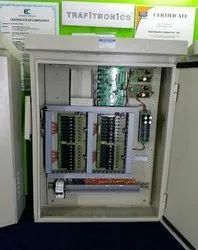 These traffic signal controllers controls up to 64 traffic signals, which are microprocessor based. These microprocessors have fixed time controllers that operates on precomputed signal plans. Looking for TRAFFIC SIGNAL CONTROLLER ?